Andy Frankenberger burst onto the poker scene in 2010 with an incredible run on the World Poker Tour where he won the WPT Legends of Poker Championship in August, finished 5th at the WPT Festa al Lago in October, and nearly made a third WPT final table in December before he busted in 16th place in the WPT Doyle Brunson Five Diamond Poker Classic. His incredible performance in WPT tournaments earned Frankenberger the WPT Player of the Year award, and now he can add a WSOP bracelet to his career accomplishments –and with a wide-open race this year is in the hunt for the WSOP POY award as well. Frankenberger’s WSOP win came in the $1,500 No Limit Holdem tournament where he bested a huge field of 2,500 players to capture the title, and in the process become the 27th first-time bracelet winner in the first 28 WSOP tournaments in 2011! 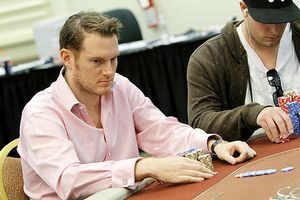 Frankenberger is now an EPT title away from the Triple Crown, and should he accomplish the feat by December of 2011 he could surpass Jake Cody’s record of winning all three Triple Crown events in the span of 16 months. This entry was posted on Sunday, June 19th, 2011 at 7:44 am and is filed under Poker News. You can follow any responses to this entry through the RSS 2.0 feed. You can leave a response, or trackback from your own site.